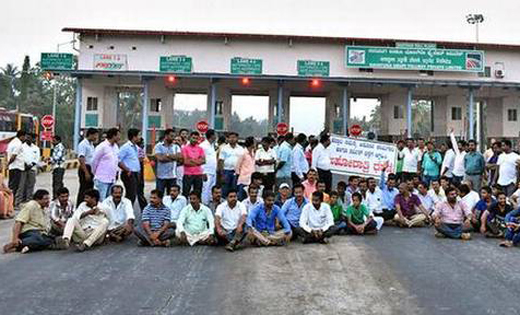 Udupi, Feb 10, 2017: The district administration has given the nod to the National Highways Authority of India (NHAI) and the Navayuga Company to collect toll at the toll gates both Hejmady and Sasthan (Gundmi) and also assured them of police protection for it. Navayuga Company has been doing the widening work on National Highway 66 from Hejmady to Kundapur. Meanwhile, a committee of engineers appointed to look into the completion of widening work, five days ago, has given its report to the district administration. G. Anuradha, Additional Deputy Commissioner, said here that the committee had not given in percentage terms the amount of the widening work done. But when the work done was converted into percentage terms, 89 % of widening work had been completed and 47 % of work on service roads had been completed on the stretch. As per the government norms, toll collection is decided on the basis of widening work, and the present widening work done was enough to qualify for it. The officers of both the NHAI and Navayuga Company had requested the district administration on toll collection both on Wednesday and Thursday. “Hence, the administration has agreed to give police protection for toll collection at the toll gates at Hejmady and Sasthan,” she said. The officers of both NHAI and the company had promised to complete the work on service roads by June and also to complete the work on flyover at Kundapur and overpass at Karavali Junction in Udupi, Ms. Anuradha said.